Today is the first day of the Orkney Pi KAL. If you have read my previous blog entries, you know that a KAL is a knit-along. A bunch of knitters get together in cyber-space and work on their projects together. This particular knit-along is being led by Elizabeth Lovick, the Scottish knitter, designer, and knitting historian. She designed the shawl using the traditional lace patterns of the knitters of the Orkney Islands off the northern coast of Scotland. A Pi shawl is an “unvention” of the late, great Elizabeth Zimmermann. It is a circular shawl knitted from the center out with the increases based upon the ratio between the circumference of a circle and its diameter. The increases all come in one round instead of gradually, and the number of stitches doubles in a single round–yes, you read that correctly. The number of stitches doubles in a single round. One might think the thing couldn’t possibly lie flat, but it will because the doubling is based upon mathematical principles. The turquoise shawl on my blog’s home page is a pi shawl. The KAL is taking place on the EZasPi Yahoo group and although I swore off KAL for 2008, I couldn’t resist joining one led by Liz Lovick herself. Today is cast-on day, so I got all my materials together. You can see them in the picture above. The crochet cotton is for the start of the shawl. When a shawl is knitted from the center out, the most difficult part is getting started, especially when the yarn is a very, very thin one. I’m using Jamieson and Smith’s Shetland Supreme 2-ply lace weight yarn that I purchased from Heirloom Knitting in the UK. One ounce contains about 315 yards of yarn. It’s a wonderful Shetland wool, worsted-spun, very crisp and full-bodied, and slightly fuzzy. Anyway, I digress. The start of a center-out shawl is the most difficult part because the knitter is working with very thin yarn and very few stitches (usually 8 or 12) on double-pointed needles (circular needles can be used instead), and it’s very fiddly. For this shawl, I am going to try Rosemarie Buchanan’s Belly Button Start. That’s what the crochet cotton is for. This is my first attempt at using this start, so I’ll let you know how it turns out. 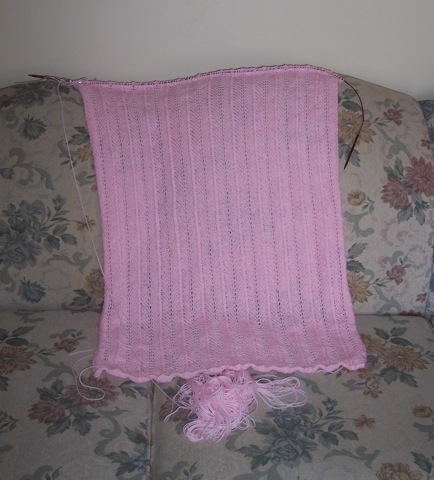 Orkney Pi is going to be competing with the Pink Cotton Candy baby blanket that is OTN (on the needles). The baby blanket is actually my mother’s project, but she is unable to knit right now due to a very serious illness, so I’m doing it for her. I’ve been working like a demon on it, trying to get it finished ASAP. It’s almost done, but it will have to wait a day for me to get my Orkney Pi started. In the battle of the desserts, the score is Pi 1–Cotton Candy 0!